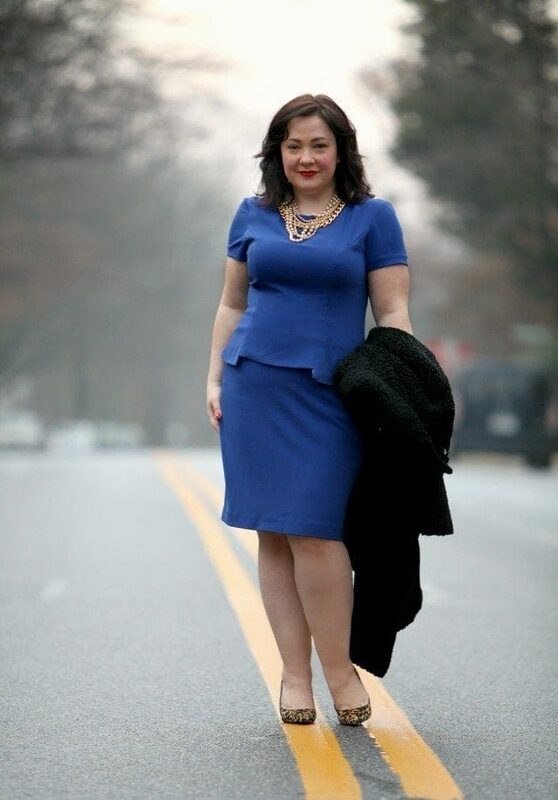 As a petite curvy woman, I find most corporate fashion requires alterations to fit. So when Nora Gardner contacted me and told me about her Chelsea Collection I was thrilled. Now those of us who are petite, tall, a different size on top than on bottom can get an almost custom fit straight from the box! Made in New York at the Garment District, Nora Gardner is exclusively for professional women who want something simple yet aesthetically pleasing that can also be worn from day to night. The Chelsea suiting collection is feminine, flattering, but works for even the most conservative workplace. Well made in a great selection of colors, I can see mixing and matching these pieces all seasons of the year. I plan on wearing the lined skirt with my black turtleneck sweater and tall boots, and the top would look great with my winter white tropical wool suiting trousers. Nora Gardner also offers gorgeous work-friendly dresses as well as professional-looking jewelry and hair accessories. 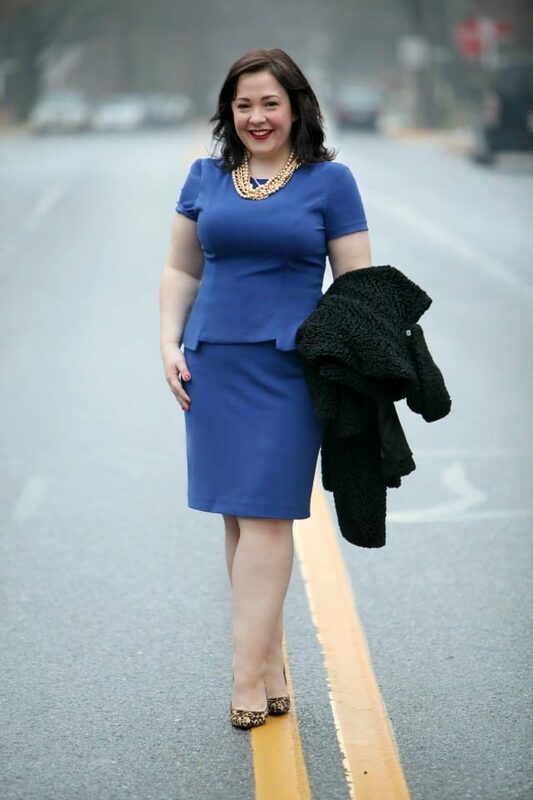 I love finding out about woman-owned and USA-made companies who understand and cater to the professional woman with style! Damn I love blue and leopard together!! I also had no idea this was a top and a skirt… thought it was a dress with a mini peplum detail! Definitely versatile 🙂 ps. is your hair darker? It’s recently dyed, this is the same color as always, but two days after being done versus later when it gently fades. 🙂 And I must day Emily I thought of you with this look, you suggested blue with my leopard dress that one time and I remembered when putting together this! Such a great color and the fit is perfect. 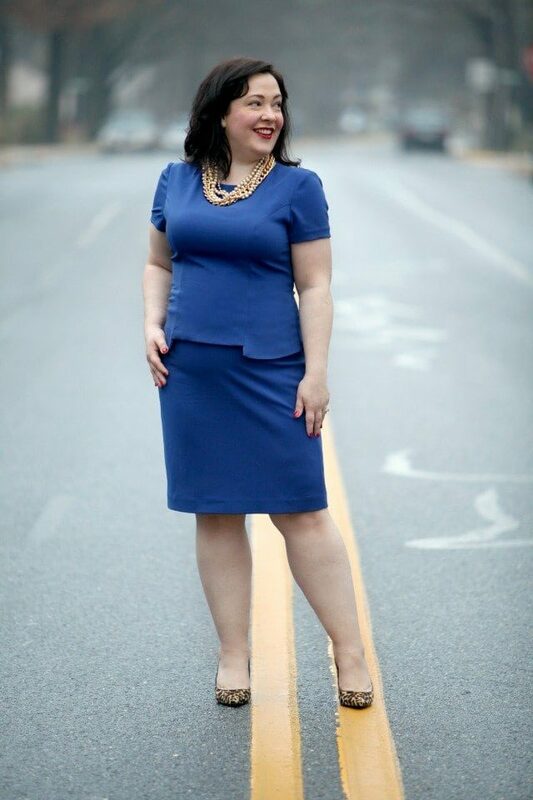 Such a nice alternative to a suit for professional women. Also love the new columnists you have been featuring. When I opened this page I actually said “Wow!” out loud. That color is stunning on you and so is the cut of the outfit! Awesome. You look great! I’m confused about this “those of us who are petite, tall, a different size on top than on bottom can get an almost custom fit straight from the box” to me implies that you can order clothes in different lengths, but I didn’t see that on the website. Am I off the mark? Sweet dress that would be perfect for an interview. Yowza! MS CEO, I presume. Gorgeous color and fit! A home run! I think you crashed her site 🙂 The link doesn’t work. Ack! I just tried all four links and they’re working now, so refresh and try again. I hope I don’t crash her site, though if she does get a bunch of sales I’d be thrilled, it’s a great quality line of clothing and Nora seems like a great person (so fun to get to connect with these designers directly!). That color is fabulous on you with your Snow White (as in Princess) complexion!